When it comes time for Rudder High School sophomore Courtney Thurman to interview for a job, she’ll be a shoo-in for the position. While only in her second year of high school, Courtney is already one of the best in our area. On Friday, Nov. 30, she’ll compete among the best in the state at the Texas FFA State Leadership Development Events Contest at Sam Houston State University in Huntsville. 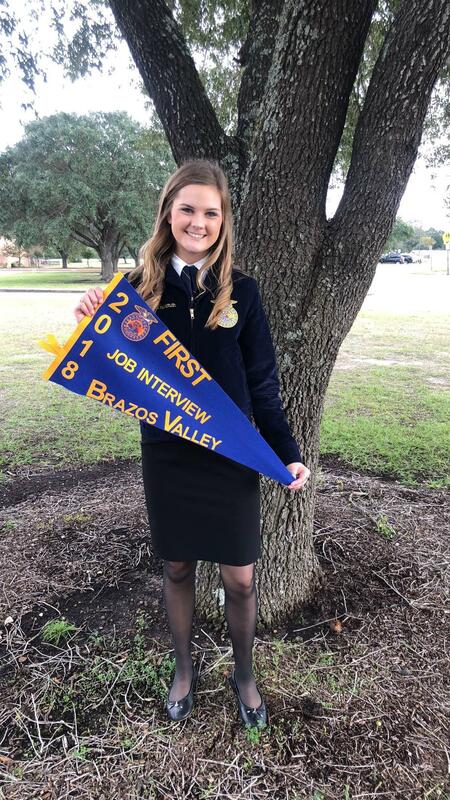 Courtney, who is a member of the nationally recognized Rudder High School FFA Chapter, won first in the job interview category at the District Leadership Development Events contest, and then took second place in the Area contest, advancing her to Friday’s State competition. While people often associate FFA with raising animals, the organization prepares students to succeed in all facets of life, including Leadership Development Events. Through these highly competitive contests, students learn important qualities and responsibilities of being a leader. Rudder High School FFA is a nationally recognized program. 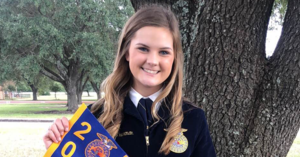 In Fall 2018 alone, Rudder FFA received a National Chapter Premiere Chapter award, students Braden and Randale Lowe won third place at the national Agri-Science Fair and Katherine Fazzino received FFA’s top national honor as a Star American Finalist and was recognized specifically by the United States Secretary of Education during her speech at the FFA National Convention.